The opening weekend box office of a film is used a measure of a film;s popularity, as a marketing tool for promoting films either by their ranking or by the records they set, and is widely considered to be a good indicator of a film’s overall box office gross. This post looks at the box office data for the opening weekend of films of films released int he UK in 2009, by examining the inequality of their distribution. 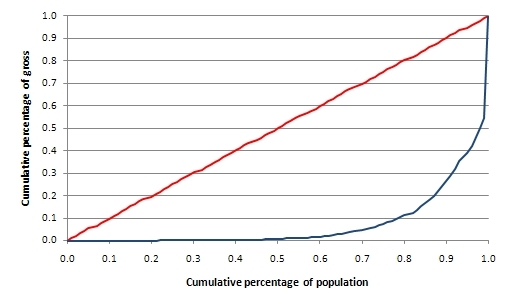 The Gini coefficient (G) is a method of representing the inequality of a population, and is commonly used by economists to represent the inequality of income in a country. 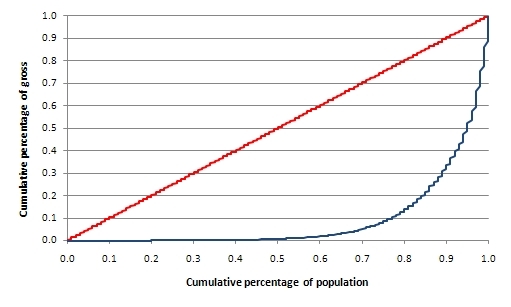 The Gini coefficient ranges from 0 to 1; and the lower the Gini coefficient, the more equal the distribution. 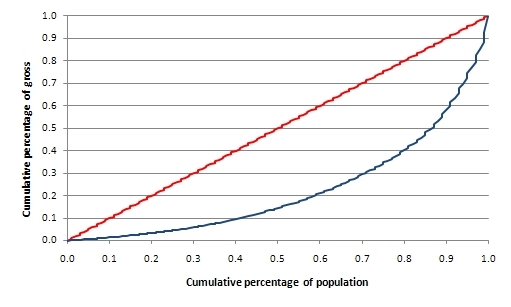 This can be represented visually by a Lorenz curve: if the distribution of box office income were equal (i.e. every film grossed the same on its opening weekend), then the curve would be a straight line from the origin – the line of equality – and G=0; and the further away from this line, the more unequal the distribution of income and the greater the value of G.
Box office data for the opening weekend was collected from the UK Film Council archive for 2009. All films were included, except films that were reissued (e.g. Barry Lyndon, Citizen Kane, The Godfather, etc). The data was sorted into different samples: the total sample of films, the top 150, US films, UK films, and Indian films. Where films have been sorted by country this includes co-productions. Where a film fits into two data sets (e.g. an UK-USA co-production), then it has been included for both categories. Any gross from previews is included in the opening weekend box office. The Gini coefficient and percentiles for the Lorenz curves were calculated using Wessa’s online calculator (here). Summary data of these samples is given in Table 1, and the Lorenz curves are presented in Figures 1 through 5. A total of 435 films released in the UK in 2009, grossing over £282 million. The film with the biggest opening weekend was Harry Potter and the Half-Blood Prince, with £19,784,924 (including previews). The films with the smallest opening weekend was The Blue Tower which grossed £94. As can be seen from Table 1, the distribution of this income is very unequal, with a high Gini coefficient; and by looking at just the top 150 films, we can see that although they accounted from approximately one-third of the total number of releases, these films account for almost all the opening weekend gross. The remaining 285 films accumulated a total of £9,158,667, or just over 3% of the total. Films listed as American (including co-productions) accounted for just under half of the total number of releases, but for over 90% of the opening weekend box office; where as films registered as British (including co-productions, and remembering that some films will feature in both data sets) accounted for approximately one-fifth of releases, but only one-sixth of the box office. Indian films (including co-productions, and with the same caveat as above) accounted for over one-tenth of releases, but for very little box office. From the Lorenz curve for the total sample of 435 films (Figure 1), we can see that the distribution of opening box office income is very unequal: 77% of films released in the UK account for just 10.4% of the total opening weekend income; while the top 5% – a total of just 22 films – account for 50% of income earned. It is clear, then, that a small number of films gross very large sums of money on their opening weekend, while the vast majority of films gross very little. A mitigating factor here is that many films released in the UK will have been released to only a small number of cinemas for short runs. The distribution of opening weekend income for the top 150 – which account over 96% of the total income – is more even, but remains dominated by a small number of high grossing films. For this data set, 50% of the films account for 15% of the box office; with the top 22 films accounting for approximately half the box office, while representing only 14% of the sample. 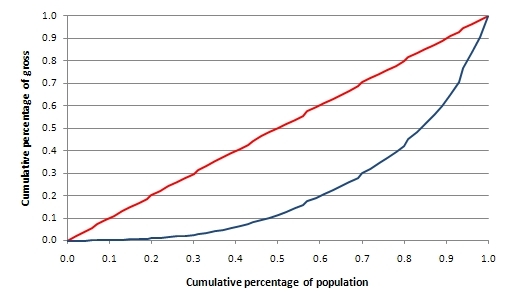 Figure 3 shows the distribution of income for American films, and lies somewhere between the curve for the total sample and that for the top 150. It is still a very unequal distribution, but can be thought of as ma mixture of the two other curves: 125 of the US films were listed in the top 150 films, and so the upper part of the curve reflects the very dominant position of these films; while the remaining 86 films grossed very little – 41% of films account for just 1% of the total gross for US films. As we would expect, the top 22 films (being the same films as above) were all US films (in various ways), and so the top 10% of this data set account for just over half the total gross. The most unequal of all the data sets is that for the UK films, and this may be accounted for by the presence of Harry Potter and the Half Blood Prince. This film accounts for 45.7% of the total opening weekend box office gross for UK films. (It should also be remembered that this film is listed as a UK/USA films, so it is also the highest grossing film in the sample of US films). The figure quoted above for Harry Potter includes £7,854,660 from previews; but, even with this gross removed, the opening weekend for this film was still 6.5 times greater than the second biggest weekend for a British film (Slumdog Millionaire – also a UK/USA film), and would still have accounted for 33.6% of the total gross of UK films. The value of G remains high at 0.8242 once this film’s previews have been taken into account. Slumdog Millionaire, as the second highest grossing British film, took £1,827,457 on its opening weekend; and the highest grossing UK film that did not involve a US producer was St. Trinian’s 2 which took £1,586,832. In the total sample of 435 films, this films was ranked 49th. Only three of the top 10 UK films did not have a US producer (St. Trinian’s 2, Harry Brown, The Young Victoria). In general, some British films do alright and these are really UK/USA films; but the vast majority of British films have opening weekends so small it really is not worth bothering with them: 79% of British films account for just 10.4% of the cumulative box office, or just £4,492,654 is grossed by 73 films. Indian films are the third largest national group of films released in the UK in 2009, behind only the US and the UK. In itself, the proportion of Indian releases at the UK box office (~12%) is an impressive figure and indicates Bollywood is gaining a growing share of screen time in the UK; but that this is not being translated into cash as Indian films remain in something of a cinematic ghetto that does not touch the mainstream. 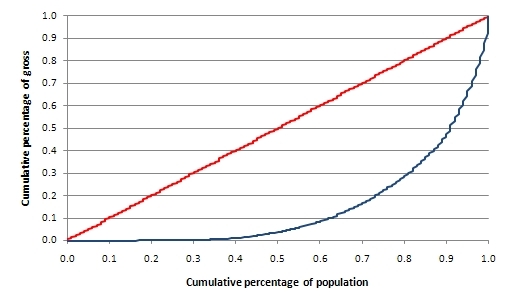 The Lorenz curve is similar to the that for the top 150 films released in the UK, and with a Gini coefficient of 0.5555 their income is more evenly distributed than is generally the case int he UK. However, it is still the case that a small number of films dominate the sample: Indian films grossed a total of £4,359,988 in the UK, with the top 17% accounting 52% of that figure. The Indian film with the biggest opening weekend was Love Aaj Kal with £405,673, but only 15 of these films grossed more than £100,000 and only 6 made it into the top 150.